The Manfrotto MTX055XPRO3 tripod is a supremely capable device that has provided a sound and stable platform in the time that I have used it. The build quality and the configuration options have allowed it to be used in a number of demanding situations without worries that it will tip over, or loose traction. The Manfrotto MHXPRO-3W head may not be the prettiest out there, but its smooth action and positive responsiveness make it an excellent companion for the tripod body. As an amateur photographer my only regret is not buying this combination sooner. The following review will be for the combined tripod and head together unless otherwise stated or where common sense prevails. The whole unit is a very stylish affair with both elements constructed of aluminium and finished in black with small \ discreet flashes of colour. The tripod has accents of brushed aluminium on the leg locks and shoulder mounts \ ratchets while the centre column collar, finger lock, and Manfrotto button is fire-engine red. The only other colour is in the white Manfrotto name and model appearing on one of the legs. The head is mainly black with red accents on the foot \ tripod attachment and around the pitch and roll handles. The two adjustable friction wheels are in brushed aluminium, and the three mini spirit levels are standard issue green. A red Manfrotto logo button finishes it off. issue The safety lock where the camera attaches is the only part that looks a little out of place being a mid-gray colour - Plain black would have been a better choice in my view. Two of the legs have 18cm rubber grips wrapped round them which makes carrying the tripod that little bit easier, although a carry strap or bag is strongly recommended. Rubber elements also appear on the head handles and are knurled to provide additional grip and work very well. They also offer some respite when working on a cold morning - bare hands on cold aluminium is not fun - The only question is why the third leg was left bare. 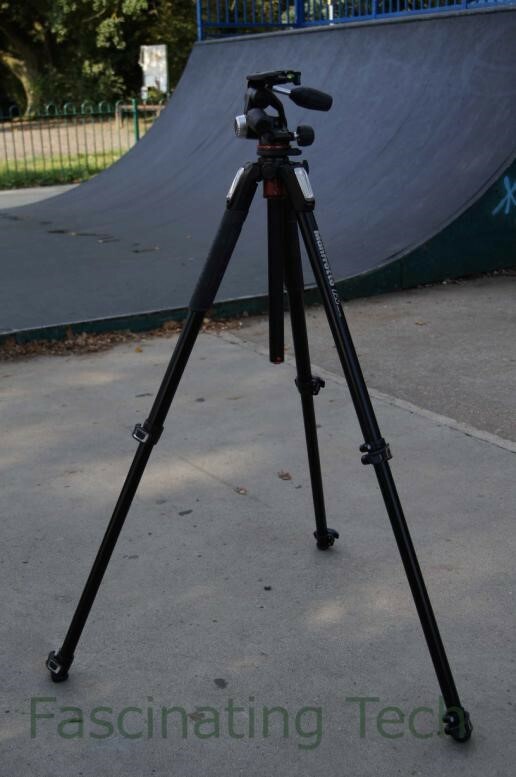 The tripod feet are made of slightly harder rubber and are screwed on - These could be replaced with spikes is you wish. With the large diameter legs and hefty quick release locks the tripod looks very rugged and professional without being ostentatious. The power locks feel as good as they look, opening with a solid snap and taking a little pressure to close them again. There is minimal rattle from the legs as they slide smoothly from inside each other but they allow for a little movement \ twisting as they extend. There is a hard stop once they are extended - IE no padding inside the tubes to stop them. The ratchets on the tripod shoulders also have a nice solid movement. It takes a little bit of effort to initially push the locks down and disengage from the current position, but once done the legs swing out and back smoothly and efficiently. The central column takes a little getting used to - Unscrew the locking nut, push in the locking pin at the base of the column, push the column all the way through the central collar then back through the collar to lock it at 90 degrees. The central column needs to be watched as it is pushed through the collar as it is quite heavy and can fall back on itself pinching an unwary finger. The complete unit is quite heavy and even with a well padded shoulder strap you will probably still notice the weight. 3.5 kilograms is easy enough to take along for short trips, but hiking around with this unit for more than 30 minutes may start wearing at your shoulders and back. HOWEVER in my view the weight is well worth it. It adds to the stability of the unit once it is in use and that is the key purpose of the unit - Providing a stable and secure platform for your camera. Everything is simply done, but done with quality. This unit provides a very stable platform for your camera. My working set up is typically top tubes at full extent, bottom tubes 3 cm short from full extent and no central column. At this height the unit may shake fractionally when knocked, but there is next to no wobble or rebound. The camera sits on the mounting plate well, although there is a very small amount of "give" if the camera is not pushed forward. With the exception of the loose shoulder strap hook, there are no rattles or squeaks from the unit that seemed to plague me when using less professional tripods or heads. The leg locks can be operated with one hand and lock firmly in place with no evidence of slipping or loosening during shoots. They offer good feedback and seem \ feel better than other locks used on earlier tripods. With regards to the head unit, the two control handles can be pushed over their respective shafts when not in use and extend to a comfortable working length when needed. When rotated they lock and unlock the tilt and pan controls smoothly with very little effort needed. With the friction wheels set correctly (for me), the tilting and panning of the camera is very smooth throughout the shot; it starts easily (no jarring), transitions with no snags and stops just as smoothly. The unit works well at ground level too; With all legs retracted and splayed at 88 degrees and with the central column pushed to its 90 degree position and at half length, the unit feels just as sturdy. There is with a little more play using the central column but as I tend to use a cable release when using the tripod in this configuration there is not much of an issue. For uneven ground, the legs adjust to accommodate most required configurations and still remain stable. If the camera looks a little shaky it's time to rethink the shot. I have not yet had chance to test the easy-link adapter but the screw fitting looks substantial and should hold the required accessories with no issue. There is no hook on the central column to hold weights to further weigh the unit down during shoots but this is expected given that the column extends through the unit itself - A hook (albeit removable) may be a problem in this instance. Also, given that the unit is quite weighty itself, the hook is not missed at all. Quick release feet - The rubber feet do a good job of keeping the unit from slipping, but as these are screwed in it would take a little time to fit spikes instead and could not be easily attempted mid-shoot. This review is intended to highlight the pros and cons of the item under review, not provide details on how to use it. Where guidance or notes on use are provided, these are the reviewers observations at the time of review and may not necessarily represent the best, easiest, recommended or proper use of it. The unit under review is mine. I bought it after reviewing a number of options from various manufacturers and visiting a number of stores to get first hand experience of them. For me, this manufacturer and model offered a good combination of quality, style and cost, with cost being one of the main drivers. After a few months use I suggested the review given my overall satisfaction with the unit. Thanks to John and the other paragliders at Butser Hill for allowing me to take photos and videos of them while testing the stability, functions and ergonomics of the equipment.